Rip N’ Flip Carbon-Reinforced Highback — flips easily between ride mode and tour mode allowing a more natural stride. Lighter and stiffer than standard glass highbacks with similar strength as carbon fiber. Pebax Pillow Line Straps — typically used in ski boots, this plastic is lighter (20% lighter than normal Pillow Line straps) and tougher in cold temps. Hollow Stainless Steel Pivot Pins and hardware — about 33% lighter than standard stainless components. Aluminum Tesla Touring Bracket — pinless system to transition quick and efficiently. Puck Compatibility — compatible with Voile or Spark, metal or plastic, canted or non-canted board-interface pucks. I’m a big fan of Spark R&D’s splitboard bindings — they’re simple, reliable, and more affordable than some of the competition. This year, the Bozeman-based brand brought two new splitboard bindings to their lineup. Their new Surge Pro and Arc Pro offer many of the features of their standard Surge and Arc bindings but come in at even lower weights. And according to Spark, the “Pro” versions don’t make any compromises in terms of performance. The new Surge Pro comes in around 200 grams lighter than the Surge, which Spark accomplished by tweaking everything from the highbacks to the custom-machined screws. The Arc Pro is lighter yet, and is marketed as a “lightweight pow-chasing binding,” while the Surge Pro is built stiffer for bigger riders and a more responsive ride. After my very positive experience with the standard Spark Surge, I was very eager to see if they had maintained the Surge’s excellent all-round performance while making the binding even lighter. As I’ve noted before in my Spark reviews, one of the things that I have always liked about Spark splitboard bindings is the simplicity of their design, particularly when it comes to transitioning between ride and tour modes. Whether on a long trip in harsh snow or just a mellow day in ideal conditions, an equipment malfunction and failure can change the situation quickly. This is why I love Spark — simple designs seem to last longer, endure more punishment, and are often relatively easy to service. The Surge Pro maintains a very similar design to the standard Surge, but has a few notable changes to help save weight. The Spark Pro’s Pebax plastic straps are claimed to be 20% lighter than the standard Surge’s Pillow Line straps. The Sure Pro’s straps appear thinner and seem to flex and conform to the boot slightly easier compared to the regular Pillow Line straps. Although the Surge Pro’s straps lack padding, they have small “pillow” indentations that mold around the boot very well and they’ve remained surprisingly comfortable and responsive on long trips. Spark’s use of plastic (instead of fabric) on the straps also helps shed snow and slush, keeping the straps remarkably light throughout the whole day. While the Pebax straps on the Surge Pro and Arc Pro are only 20% lighter than the standard Pillow Line straps, it is impressive to see Spark shaving even more weight off the binding each year. For comparison, the regular Pillow Line straps are supposedly 40% lighter than Spark’s previous (16/17) straps, making the Surge Pro’s lighter straps even more impressive. Spark’s “Tesla System” on the Surge Pro remains pretty much the same as it has been for the last couple of years. It’s operated by an easy flip of the metal bracket under the toe, which attaches or detaches the binding from touring brackets or plates. The Surge Pro remains compatible with the older Voile / Spark puck versions, as well as the newer metal and canted Spark mounting pucks and older-style aluminum touring brackets. Although I experienced minor issues with the toe bracket, Spark says they’re continuing to advance the interface, primarily to avoid unwanted abrasion / wallowing of the aluminum pins. I’ll go into more detail on this in the “Touring” section. The Surge Pro’s T1 wire system remains the same as that on the standard Surge. The single T1 climbing wire offers a high and low setting (18° & 12°) for easy touring on a variety of slope angles. I have always been a big advocate of the wire heel lifts as, again, I often find that simplicity is best. The T1 wire is located under the heel of the binding and is made easily accessible with Spark’s “Whammy Bar” — a metal spur that sticks off the side of the binding and allows for easy engagement with a ski pole. 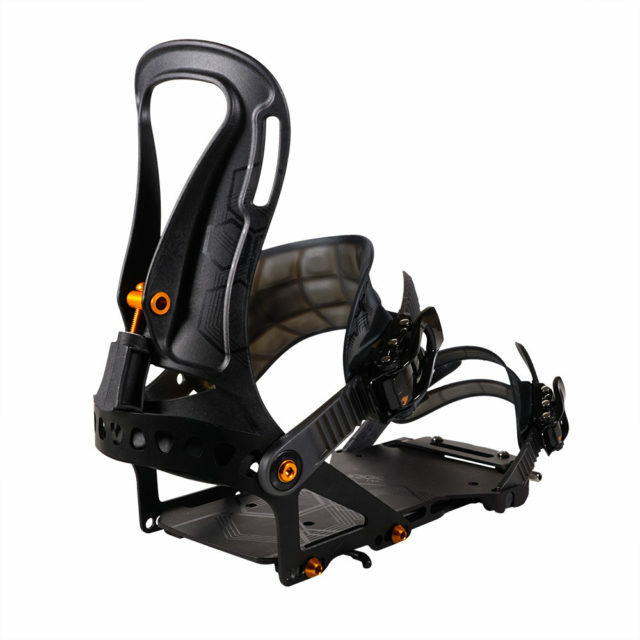 The Spark climbing-wire design feels solid and I’ve found it to be slightly easier to use than the plastic heel lifts on Karakoram’s splitboard bindings. I’ve never had any major issues with climbing bails on the Surge or Surge Pro, although they sometimes feel sticky throughout the day. The Surge Pro is also compatible with Spark’s T1 heel lockers, which you can mount on the board to lock the heel of the binding down in tour-mode for more control while descending with the board split. While it is a very nice feature for specific scenarios, I rarely feel the need to lock down the heels, even when skiing for longer distances. For more info on the Tesla T1 system and all the numerous accessories, check out Spark’s website. The Surge Pro’s carbon-reinforced nylon highback is the same shape as the regular Surge, which I have had no issues with. Spark claims that the carbon-reinforced nylon highbacks are “more responsive, lighter, and stiffer than our standard glass reinforced highbacks.” While I can’t really feel a performance difference between the highbacks on the normal Surge and the Surge Pro, that’s not necessarily a bad thing — reducing weight without reducing the performance is still a step in the right direction. The highbacks on all of Spark’s bindings feature their “Rip N Flip” system, which lets you transition from a forward-lean ride mode (0-22°) to a much slacker -13° touring position. This slacker highback angle allows for longer strides and more efficient skinning, which can reduce calf fatigue. The Surge Pro is compatible with Spark’s Pro Ibex aluminum crampon, which can be attached or removed without unstrapping. The Pro Ibex crampon features brass pins to help avoid wear on the aluminum, in addition to shaving grams off of the crampon by switching to a lighter, thinner 7075 aluminum plate. The Surge Pro is an excellent binding to tour on. 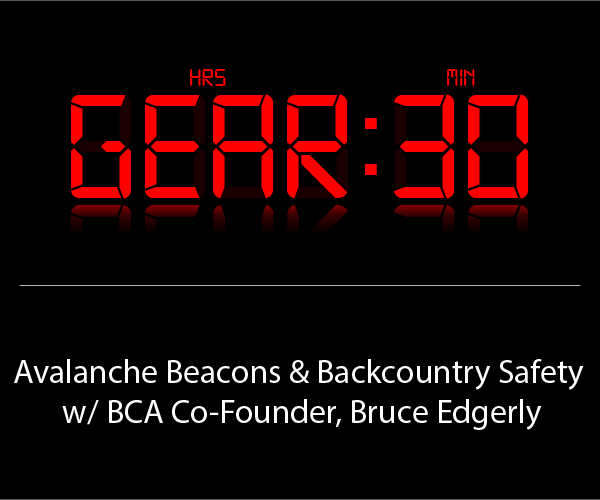 It is impressively light, simple, and very comfortable during long days in the backcountry. I’ve found that the carbon versions of Karakoram’s Prime bindings offer slightly better lateral edge power transfer when side-hilling on firmer snow, which may be a result of the Prime Carbon’s stiffer carbon highback and the different design and geometry of its touring bracket and heel lifts. However, in softer conditions, there are no notable differences while side-hilling. Like the Karakoram Prime system, I have found that the Spark touring brackets (on both the Surge and Surge Pro) get a bit sloppy after heavy use, resulting in 1-2 mm of play. Although this problem seems to plague most splitboard bindings and is not detrimental to the bindings’ performance, it seems like an area for improvement. The Surge Pro’s “Rip N Flip” bracket on the highback allows for quick and easy transitions between ride and tour mode. The highbacks fit well on both the K2 Aspect and K2 Ender, resulting in a very smooth and comfortable feel while skinning. A few key differences stood out when comparing the Surge Pro to the Karakoram Prime Carbon bindings. Although I have had considerable issues with the older-generation Karakoram heel lifts collapsing (particularly on firm snow), I felt as though I was able to apply more edge pressure when side-hilling on firm conditions on the Karakoram heel lifters than I could with the T1 wires on the Surge Pro. However, engaging the T1 wires and transitioning between high and low settings is much easier with the T1 wires than it is with the Karakoram system. 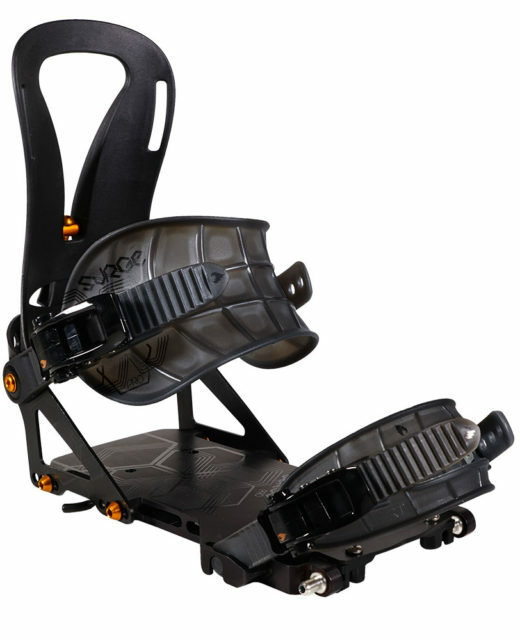 Both Karakoram and Spark offer a way to secure the upper cuff of the boot to the top of the highback. Spark offers a velcro “Strappy Strap” to increase the lateral support when touring, which is similar to Karakoram’s “Flex-lock” system. These options have both proven to be very useful on hardpack, particularly while wearing a heavy pack. Transitions have always been smooth and effortless while using the Spark / Voile puck system. I’ve never had a major problem with icing when transitioning, which contrasts my experience with the Karakoram Prime bindings. With the Primes, I often have to scrape away all the snow around the interface to ensure a tight fit during the first attempt. With the Spark Surge and Surge Pro (and while maybe not advisable), I am usually able to forcibly slide the bindings onto the pucks for riding mode without any issues. The plastic easily sheds ice and snow build-up, and I have yet to notice any damage on the binding or interface (even during my forceful transition technique). From my experience, the same cannot be done with the Karakoram interface without the risk of damage. The simplicity of the puck system appears to be why it has remained relatively unchanged since Spark’s early years. Though the Spark interface has proven to be very durable and I’ve been able to get away with sliding the bindings on the pucks without clearing snow, I would recommend clearing all ice and snow buildup from the toe-locking mechanism of the Tesla System during transitions. I have seen the plastic under the toe bracket fail a few times on my friends’ Spark bindings. Since this piece is critical for the binding to function both while touring and riding, I highly recommend clearing any snow / ice from the toe-lock mechanism. One key difference with the Karakoram interface is its ability to transfer from ride mode to tour mode without removing the binding from your boot. While it’s not essential, this saves a pretty major step during each transition, making transitions a bit faster compared to the Spark interface. This is particularly noticeable when riding really benchy / rolling terrain where you are often switching to ski mode to make it across the flats. Much like the Surge, the Surge Pro is an excellent binding for those who take a playful / freeride approach to the backcountry. Overall, the Surge Pro performs nearly identical to the heavier Surge. While I typically enjoy boards, boots, and bindings that are on the stiffer side, I’ve found the Surge Pro to be plenty stiff for most scenarios. I am very impressed by the playfulness of the Surge Pro’s chassis, despite it still being able to deliver power to the edges when needed. Its solid baseplate (as opposed to the milled-out version on the Arc) seems to stiffen up the torsional flex, which is nice since it holds the board together well and provides stability when riding hard and fast. However, the solid baseplate does prevent the binding from flexing naturally with the board, which decreases the board feel. If you’re looking for a surfier binding, perhaps consider the Surge’s lighter and softer brothers, the Arc and Arc Pro. 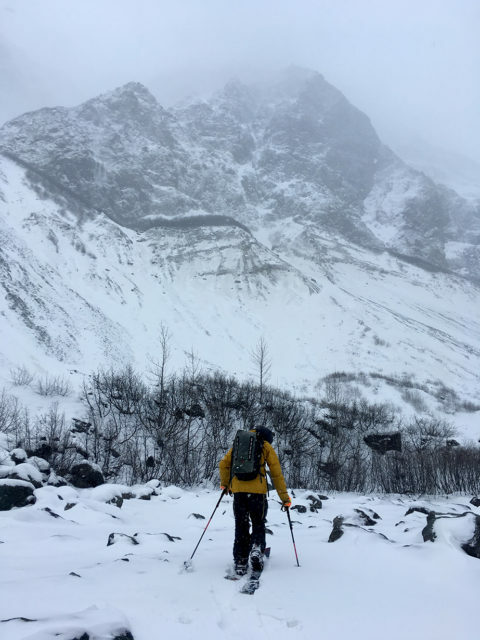 Since it’s very playful and stiff enough to charge hard through most conditions, the Surge Pro would be an excellent choice for a wide range of backcountry endeavors. It should be especially appealing for those who like to charge at higher speeds and seek out natural features, or bigger riders who need a stiffer platform to transfer energy more efficiently. While the Surge and Surge Pro are supportive enough for most scenarios, I’d recommend a stiffer binding like the Karakoram Prime-X Carbon if you often find yourself in variable conditions with significant exposure (e.g., more mountaineering-style days). When riding bigger lines where the snow quality often transitions from soft to super firm, I have found a stiffer chassis and a full-carbon highback can help inspire confidence and deliver increased responsiveness. 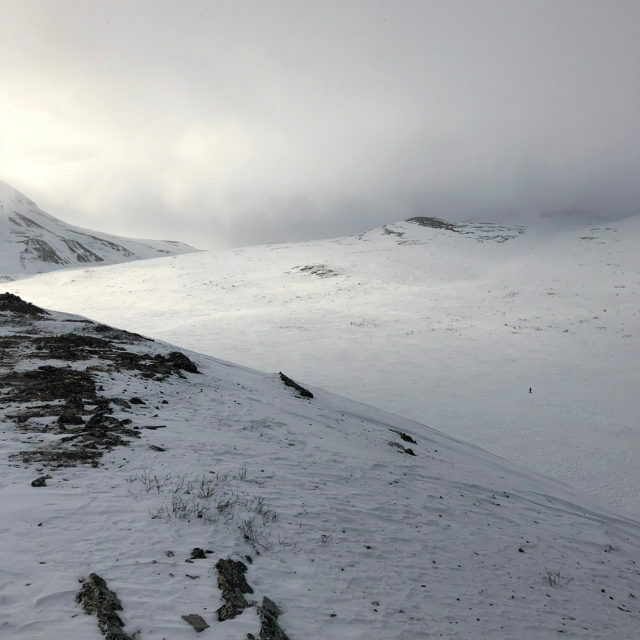 While it was never a major issue, I did wish that the Surge Pro was slightly stiffer and more supportive when edging across sastrugi and rock-hard wind drifts while riding in the Brooks Range, AK. Compared to the old Karakoram Prime Carbon, I seemed to get more foot and calf fatigue in the Surge Pro. But for anything less consequential — when the day’s objective is about having fun and shredding softer snow — the Surge Pro is a great tool. It excels while hucking off drops, sending natural features, or slashing big powder turns. The Surge Pro is snappy yet soft enough to easily tweak grabs, butter the board, and take a playful approach while surfing down the mountain. Like the Surge, I found that the Surge Pro really compliments surf-inspired boards that are designed around laying down surfy turns. Coupled with the Amplid Millisurf, Venture Euphoria, Never Summer Swift, and K2 Split Bean, the Surge Pro feels stiff enough to be supportive on a swallowtail and powerful enough to hold a solid edge when railing hard turns. Apart from the issues with the touring pins and brackets becoming slightly wallowed out, the Surge Pro has proven to be a very durable binding. As mentioned above, the slop in the touring brackets seems to plague most splitboard bindings, and is not detrimental to the bindings performance. The components and build of the Surge Pro seem very solid, which is a trait I’ve noticed with most Spark products. 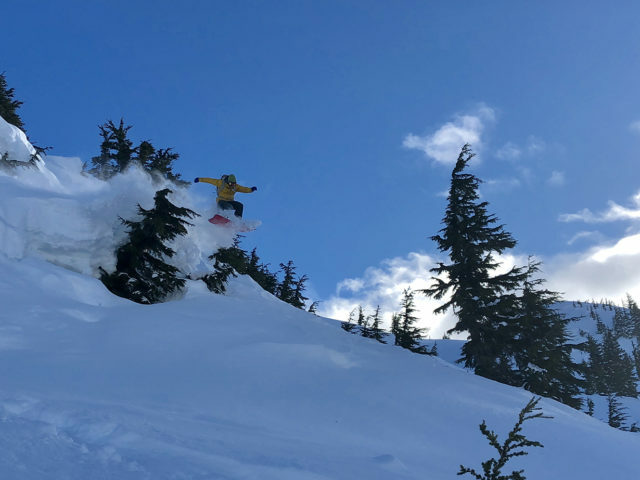 When it comes to most splitboard-specific gear, I have found a choice must often be made — opt for an extremely durable, yet slightly heavier and less precise option, or go with a very light and precise tool which may not last quite as long. While it’s not as responsive as the Karakoram Prime Carbon or Prime X, the Surge Pro is lighter, significantly cheaper, and has so far proven to be just as durable as the standard Surge. The Surge Pro is an excellent choice for beginner to advanced riders wanting to shave grams off of their setup while maintaining a relatively stiff and responsive ride. The Surge Pro’s flex makes it a particularly compelling option for those who like to take a more freeride / freestyle approach to the mountain. As with the Surge, I would not recommend the Surge Pro for mountaineering-style riding (where a stiffer binding would be better). It is, however, a great choice for pretty much anything else — particularly for bigger riders or someone looking for a stiffer binding that’s still playful enough for casual riding. The Spark R&D Surge Pro is an excellent splitboard binding, and it’s proven to offer pretty much all of the performance of the standard Surge binding while shaving off some weight. I’d recommend it to anyone looking for a solid, dependable, freeride splitboard binding. The Surge Pro is more affordable than options from Karakoram, is one of the lightest splitboard bindings available, and I haven’t had any significant issues with its durability. If the highest level of precision is needed, the Karakoram Prime-X Carbon or Prime X may be better choices. But for those who value durability, low weight, affordability, and / or who take a more playful approach to the mountain, the Surge Pro is definitely worth checking out. Nice one! You guys need to do a review on the new Karakoram gear, saw the new ride mode hardware and Prime X in person and there are so many awesome updates.